It was a star-studded evening at Raffles nightclub in Chelsea as several familiar faces turned out for a night on the town on Thursday. Leading the way was Love Island star Kaz Crossley who turned heads in a low-cut fluorescent orange top which she paired with black soft leather trousers with a wide leg. The TV star, 24, looked in high spirits for the evening, styling her locks into an updo and completing her look with a black handbag. TOWIE star Shelby Tribble also enjoyed an evening out with pals. The former Miss Great Britain donned a light pink blazer style mini-dress and added height to her frame with a pair of matching heels with a stud embellishment. Letting her brunette locks hang loose down her shoulders, she accessorised with an animal print handbag. Joining her was fellow TOWIE star Chloe Meadows who turned heads in a low-cut black crop top with a cut out at the midriff. She added to her look with blue jeans and black ankle boots and wrapped up with a faux fur black coat. Model Roxy Horner wore a black leather mini-dress with a v-neckline and patterned tights. Sporting black heels, she carried a white and black patterned coat and completed her look with a daring red lip. 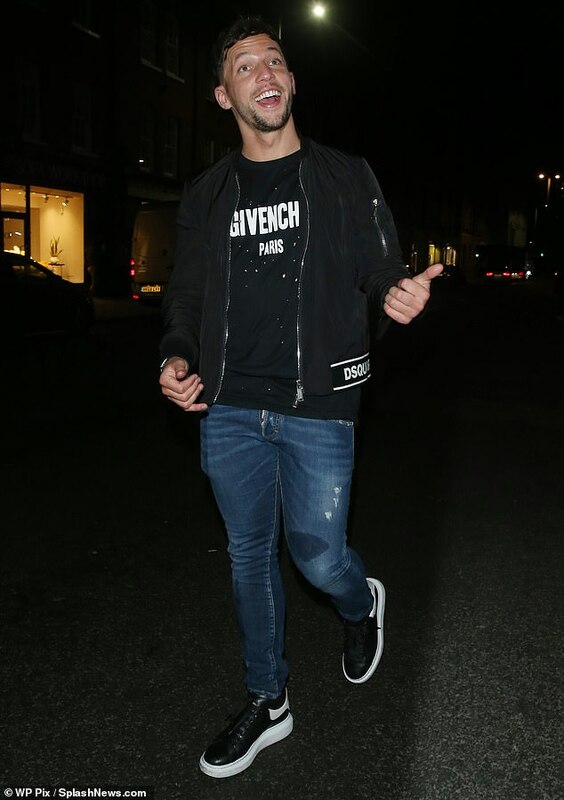 Many Chelsea footballers were also enjoying a night out as they prepare for their Premier League Clash with London’s West Ham on Monday night. Ross Barkley, Danny Drinkwater, Gary Cahill, Ethan Ampadu, Emerson Palmieri and Ruben Loftus-Cheek were all pictured making their way out of the high-end venue. 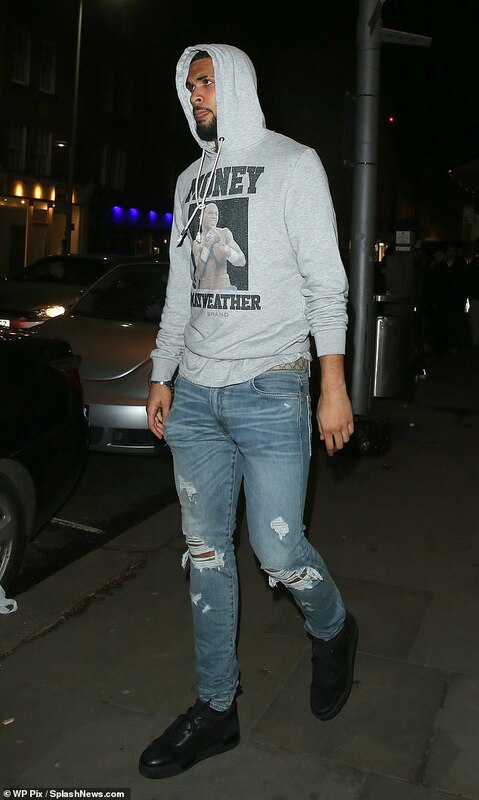 Danny, Gary and Ruben were snapped leaving the club between 1 and 2am, with Ruben sporting a ‘Money Mayweather’ hoodie emblazoned with a photo of former five-weight world champion Floyd Mayweather. 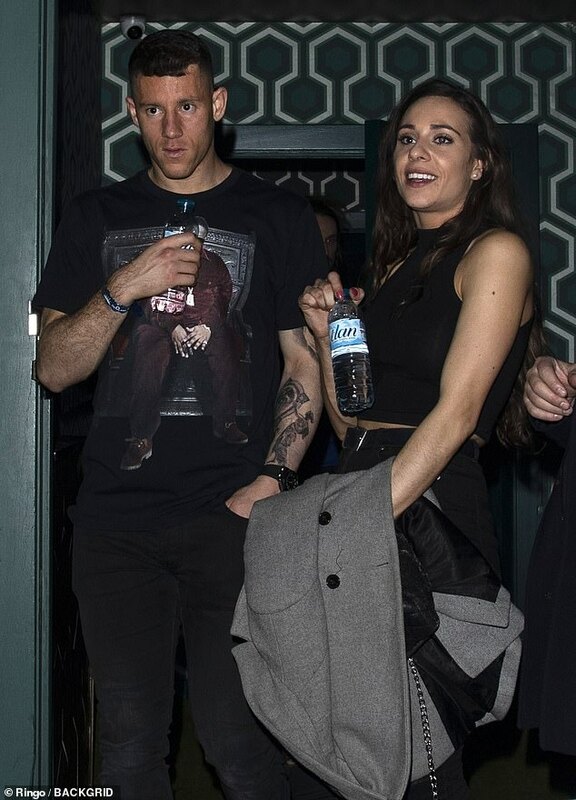 Ross, meanwhile, was pictured making his way out of the venue around 5am with a female friend. Chelsea last played on Wednesday, when they beat Brighton to follow up their dramatic win away at struggling Cardiff last weekend. Raffles, which only recently reopened, claims to be ‘one of Chelsea’s most popular nightclubs’, offering its guests a ‘discreet and intimate clubbing experience’.